We have been very busy here at Friends of the Boar since culling was resumed. We have felt it necessary to attempt to answer lots of queries and press articles that appear to be focused upon one topic only - BOAR DIGGINGS. 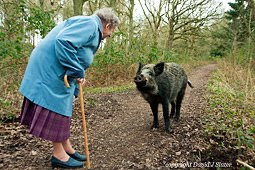 In the years leading up to the formation of Friends of the Boar, a few passionate wildlife enthusiasts and photographers who had first-hand experience of the boar were kept busy attempting to allay public fears of how dangerous the boar are. The press, as always, were siding with the authoritarian view of the Forestry Commission, presenting stories of dog attacks as if they were commonplace, fretful of boar attacking children, and of boar numbers becoming so high there would be no space for humans. Thankfully, after a lot of patience and education, not to mention the fact that maybe 50% of local residents have now experienced the boar at close quarters, these fears have faded. People are now resentful at being duped with front page stories of hogzillas and the promoted image of the boar by the fake experts, namely the Forestry Commission. Many locals seriously believed that boar looked something like the Looney Toons character "Taz the Tasmanian Devil", a muscular tusked hairy beast that delights in unprovoked frenzied charges at everything in his path! "TAZ" is NOT a WILD BOAR! Almost universally included within the press stories of boar diggings in the last month is the totally illogical connection that they are somehow correlated with boar numbers. Ian Harvey, head ranger of the local FC, as been quoted several times linking increasing levels of roadside verge activity to increasing numbers of boar (2009-2010). At one point his conditioned mantra seemed to be the only census technique he was capable of....although some people would still say it is! This is typical rhetoric of those who delight in hunting the boar. Time and again we hear the same old nonsense from hunters, including the Forestry Commission, that boar have no predators and will over-run the place with a compounded trebling of numbers each year, and of course digging up everything in sight. Loaded language is almost second nature to these conditioned individuals, who no doubt got their lessons in ecology from their hunting daddies and mummies: phrases like "rampaging boar", "devastation", "fury", "invasion", roll from their tongues at the slightest bit of grass damage found by residents. Since the infamous release of boar in 2004, wildlife enthusiasts had been using the diggings to find the boar. Noting their positions daily, using new diggings to start searches for the boar. Roadsides have been continuously monitored as part of their hobby, and in some cases their professions. They can confirm that road diggings are massively down compared to the last 3 years (2009), thanks to the closed-season. Before that, boar numbers were so low (20-100) that road diggings were less conspicuous. 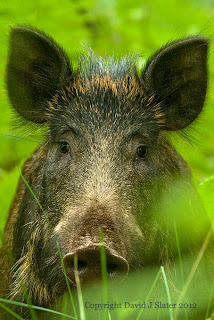 We have just had a YEAR-LONG closed season when no boar were hunted except a small number of road casualities. The closed-season began in September 2011, and the following 2 months saw the usual road verge diggings taking place. 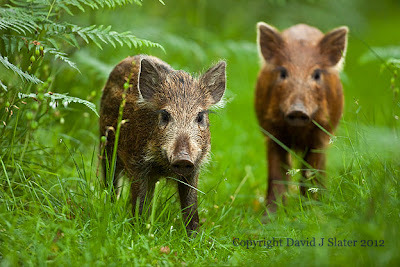 For the first time since 2007, little piglets have not been hunted or their mothers shot by the Forestry Commission. Residents will hopefully remember the long stretches of roadside down the Cannop Valley, along the Speech House to New Fancy View road, and down into Parkend and onwards into Coleford being an almost continuous "dig". Speech House road between Coleford and Cinderford, similarly had a lot of road diggings for all to see. Picnic sites at Wenchford, Beechenhurst, Linear Park, Mallards Pike and Cannop had all been severely dug. Remember - this was when the Forest had the Beechenhurst Six roaming about the centre of the Forest, a family of tame boar and piglets we have previously blogged about. This family were digging at Beechenhurst and around Speech House for all to see, and it was the threat that the FC had announced they were to kill these boar that added to the protests and the decision to have a year-long stop on killing the boar. Another sow with her family relaxing in the heart of the Forest of Dean. So the bloodsport halted. The FC were confident of uproar by the public (witnessed at a meeting between the Friends, Councillors and Kevin Stannard of the FC), and hunters began writing to the nationals warning of a Berlin style onslaught of boar raiding towns. THE CLOSED SEASON was a resounding SUCCESS. By the new year, roadside grass activity had almost completely disappeared. The boar left the villages of Parkend and elsewhere. An environment of peace and relaxation took over. The boar moved back into the deeper parts of the Forest where high seats stood empty as reminders of the past. The Forestry Commission were putting the population at 450 animals at the start of the closed-season (September 2011). They predicted, that the population would TREBLE. By September 2012 when they will resume culing, that means 1,350 boar will be here. By contrast, we were claiming only 100 boar were present in the Forest of Dean at the start of the closed-season. This met the usual tuts and sneers from those who think they know best. We predicted the population would stabilise according to the studies from European boar that give densities of 3-4 boar per square km. 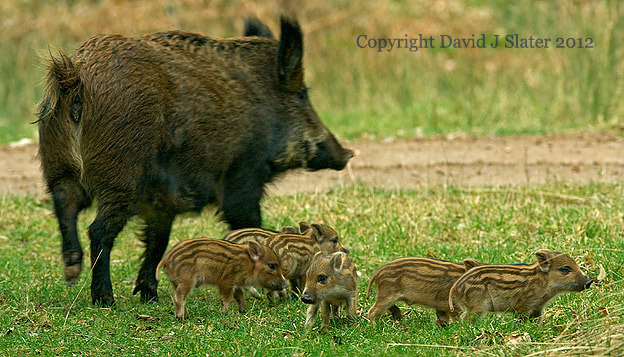 In terms of the Forest of Dean, this would equate to 180 - 240 boar provided no artificial feeding took place. Censuses were done by both the FC and Friends of the Boar as previously outlined in this blog. The FC census concluded a population as of August 30th 2012 at 600. The Freinds census put it at 200. NOW NOTE. The FC had just reduced the population from 1,350 to 600 (more than a halving)! The Friends had increased the population from 100 to 200 (a doubling). No shooting for full year! ASK: WHO HAS THE MATHS RIGHT? What are we now seeing and hearing? Well, the FC now suddenly begin claiming that boar numbers only double each year! REALLY! Don't you mean a decrease of 56% per year, or are you just taking our figures now, hoping nobody notices? This statement was provided both by Kevin Stannard in a recent press piece, and by Robin Gill, Forest research scientist at the Boar Scrutiny Meeting in August 2012 (also documented below on this blog). Talk about changing goalposts, and in the face of their own contrary predictions! We really feel sad to keep highlighting the apparent cluelessness and hypocricy of the local government here residing at the Forestry Commission in Bank House in Coleford, but we can only report honestly as this is our way (remember that we are not-for-profit). On the ground we saw almost an ENTIRE YEAR of NO ROAD DIGGING. From around January - August 2012, the roadsides were free of overturned soil. The Cannop Valley, for the first time in 7 years, was free of soil. Soudley, Parkend, Whitecroft, Ruardean, Sling, all villages traditionally dug, were now free of dirt! Visitors to picnic sites would be hard pressed to find a single hoof print of a boar. THE BOAR WERE NOW WHERE THEY BELONG - IN THE DEEPER PARTS OF THE FOREST. Sightings collected by the Friends were showing conclusively that the boar poulation may have reached 400 in April, but had declined to 200 by August. A 50% mortality seems to have occurred - all without the presence of wolves or guns!!!! The Friends' estimates at the start of the closed season of 200 were vindicated, albeit by our own census (we understand how critics may ignore this). But hunting resumed in the first week of September 2012. Immediately a single boar came into Coleford town centre. "Fury as Boar Run Amok in Town centre" was plastered everywhere by The Forester newspaper. The loaded language had resumed by the press and hunting fraternity! Boar came into villages almost overnight. Sling and Ruardaen were hit, as was Soudley and Blakeney. And what did we learn? THE BOAR WERE NOW BEING HUNTED DEEP IN THE FOREST BY THE FORESTRY COMMISSION! Oh yes, hunting at baited places in the remoter parts to make the cull easier! Alternatively, some rangers feel free to shoot on-sight any boar they stumble across in broad daylight on public land, as they did near to Speech House that first week of the cull, much to the shock of a very fightened tourist nearby. Thankfully, a Friends of the Boar supporter was there to help them return to their car, visibly shaken. When challenged by the Friends in an open letter to Ian Harvey, the FC claimed (via the press) they do not kill nuisance boar by villages due to health and safety! WOW, it's now ok to shoot in the daytime in the Forest near Speech House with many visitors nearby, but shooting near villages to help farmers and villagers is a no-no! GO READ - the FC have always said, including in their OWN Boar Management Strategy (see link to this on main page), that problem boar will be prioritised in any cull. No mention in the press of how the FC had got their sums wrong. No mention of how we had just witnessed a quiet year with regard to boar diggings. ALL FORGOTTEN by those who wish to profit from the boar by either hunting or the selling of local newspapers. The Forester and especially The Review newspapers (both owned by Sir Ray Tindle of Tindle newspapers) delighted in presenting unrepresentative and very rare and localised stories of people upset at some digging by their houses or in their gardens, as though the Forest was entirley dug to bits! The Forester and Review both published highly misleading stories and letters from anonymous writers, with editors getting in on the act in an attempt to dismiss and mock our efforts to promote truth and promotion of wildlife. Letters sent by us were ignored or delayed by weeks to appear ineffective and random. Press releases announcing our intentions to help those with diggings on private land were also ignored. This would obviously negate the hatred these two Tindle newspapers were fostering, and so decided to ignore us on purpose. Without any investigation into the truth or validity of their correspondence, these papers quoted residents saying that boar numbers were too high and out of control. Anonymous opinions were published without question to fuel an agenda. Not once did they ask us to comment. Because if they did, this type of scaremongering and last ditch attempt at getting the public to support hunting would be a failure. They have tried their very best to present UTTER RUBBISH in order to get people here angry. To us the Forester and Review Newspapers have acted not only immorally and unfairly but maliciously towards the boar and to those who support them. We only hope they will apologise and make every attempt to tell the opposite view and also to present veryfiable facts about the boar. One of these FACTS is that WE SHOULD REJOICE THE SUCCESS OF THE FIRST WILD BOAR CLOSED SEASON IN THE UK, for it alleviated ALL that people fear, from attacks upon dogs and people to roadside grass damage. Thank You Mrs Boar for your efforts to make the Forest of Dean and all UK woodland a pleasure to visit. For researchers who wish to investigate the substance of this article, with some press examples, please contact David Slater via this blog - go to contact. Can we please urge all residents to submit sightings of the boar via our contact page (in the side panel). The data we receive is strictly confidential and will never be seen by any hunters. Huge fan of the wild boar. Got to see one on a trip last year and it was amazing. Nice to get your comment Mike and better still to know you are a huge fan of the boar too. 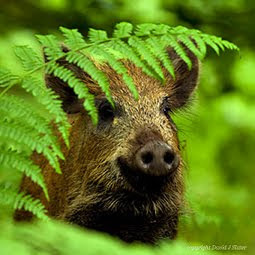 Keep checking back in case Friends of the Boar need your help, but at the moment evrything seems good for the boar here in the Forest of Dean, though somewhat lowish on sightings at present after the recent round of killing by the Forestry Commission.